Shirley Temple, from The Little Princess. On the whole, children's parties used to be fairly simple affairs and not too difficult to organize. There was a cake, candles, balloons, party hats, lemonade, treats and party games. At the end of the festivities each child might take home a coloured cardboard lolly bag and a slice of birthday cake, wrapped in a serviette. Of course, sometimes there were stand-out parties, which may have been extra lavish or included something special, such as a theme or a a children's entertainer of some description. Although the traditional kid's party is still alive and well, there are some differences in the 21st Century...some subtle, some not. Plus not everyone is willing to throw an at-home event for kids. Stressed, usually time-pressed parents, often farm their children's parties out to a third party..most often McDonald's. Theme parties seem to be popular - from Alice in Wonderland tea parties to Fairy Princess extravaganzas. 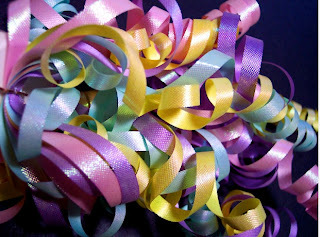 However it's not really necessary to go overboard with the kids party thing, unless of course, you want to...and really, it's just as easy to throw a simple, old fashioned party at home as it is to launch one at a hamburger chain. In fact, throwing a kids party can be a lot of fun. Certainly, you'll be confronted with a bunch of excited children to entertain but at the max the average children's party goes for around one and a half to two hours and much of that time can be taken up with organized games. - pass the parcel, pin the tail on the donkey, musical chairs....just to name a few oldies but goodies. The there's the cake cutting and singing 'Happy Birthday', as long as you've paid your copyright fee (just kidding about that one). These days it's become common practice to ensure every child at the party receives a prize - I'm not sure if this is a good or bad thing. Isn't the point of prizes that not everyone wins? Should there be a present for each child in every layer of pass the parcel? Do you keep playing pin the tail on the donkey 'till each child has nailed it and won something? Personally think the prizes are more special when they're scarcer. Children do understand this. It's a little like every child at school getting a gold star without having earnt it...not a great lesson for the real world. As long as each child goes home with a balloon, a slice of cake and a small bag of treats, they should be satisfied - and so will you, when the party's over and the last child has returned to his or her home. Hopefully you'll be left with a sense of achievement and a shared, lasting memory for you and your child.